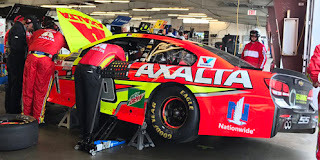 Dale Earnhardt, Jr. picked up the 10th last-place finish of his Monster Energy NASCAR Cup Series career in Sunday’s I Love New York 355 at the Glen at Watkins Glen International when his #88 Axalta Chevrolet lost the engine after 22 of 90 laps. The finish, which came in Earnhardt’s 617th series start, was his first of the season and his first in a Cup Series race since May 1, 2016, 48 races ago, when a pair of crashes ended his GEICO 500 at Talladega after 63 laps. Between these two last-place finishes, there has been no shortage of news about NASCAR’s most popular driver. On June 12, 2016, a concussion suffered in a crash at Michigan ultimately led to Earnhardt sitting out the second half of the season, putting Jeff Gordon and Alex Bowman behind the wheel. He returned to Daytona this February, but on April 25, just days before the ninth race at Richmond, Earnhardt announced his retirement from Cup competition at season’s end, a year which in June was crowned the “Appreci88ion Tour.” The final piece of the puzzle came on July 20, when Alex Bowman was announced as Earnhardt’s replacement in 2018. Bowman, who won a pole at Phoenix during his partial 2016 campaign, had also driven Earnhardt’s car to a 3rd-place finish in this year’s Advance Auto Parts Clash. 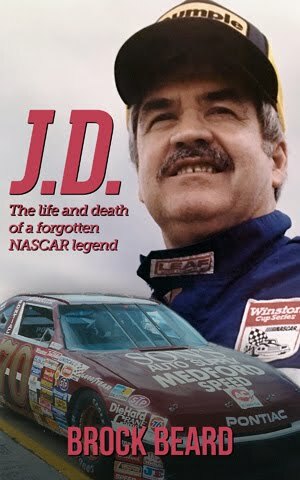 Ever since the Richmond announcement, Earnhardt has put even greater emphasis on winning races, but has continued to struggle. His best finish of the season remains his lone Top 5 at Texas on April 9, the same track which saw his first wins in both Cup and XFINITY competition. He was the favorite to win his final Coke Zero 400 appearance last month, having won the pole and even rebounded from an early accident to contend for the lead. But when a second crash put him out, leaving him 32nd, he remained just 22nd in the series standings. Watkins Glen, however, presented another opportunity for a strong run. At Sonoma in June, Earnhardt spun out early, collecting Danica Patrick and Kyle Larson, but fought his way back to finish 6th. Though winless on either of the Cup Series’ two road courses, his statistics at Watkins Glen were much better – a track-best 3rd in 2003, a 5th in 2004, and a 10th in 2005 among his seven Top-15 runs in 16 previous starts. An "Appreci88ion Tour" video posted earlier in the week also reminded fans of his XFINITY Series win at The Glen in 1998, where he raced door-to-door with Chevrolet factory driver Ron Fellows. Last week, Earnhardt started the weekend 26th in Saturday’s opening practice, slipped to 31st in Happy Hour, and managed just 28th in qualifying with a lap of 123.457mph. Just 37 drivers lined up for Sunday’s race, marking the shortest Watkins Glen field since 36 took the green in 1986. Starting from the 37th spot was Matt DiBenedetto, whose #32 Incredible Bank Ford managed only 117.930mph, more than a half-second slower than the next-slowest car. In the aftermath of NASCAR’s second-straight same-day qualifying session, DiBenedetto was also one of six drivers sent to the rear for unapproved adjustments: Paul Menard, Ryan Newman, Boris Said, Clint Bowyer, and NASCAR Pinty’s Series driver Gary Klutt, making his debut in the #15 Color Compass Corporation Chevrolet for Premium Motorsports. Klutt would finish 31st on Sunday, having avoided losing a lap during the first stage before he finally did near the end. Near the end of the first pace lap, 30th-place starter Trevor Bayne fell to the back of the pack, then pulled his #6 AdvoCare Ford down pit road, citing brake trouble. The crew looked under the hood, then sent him back out again to catch the tail end of the field. The Roush-Fenway Racing team did the same the next time by, and this time Bayne was just able to catch the tail end of the pack on the chute heading into Turn 6. But when the leaders came down to take the green, Bayne pulled off a third time, following the pace car onto pit road, then turned a hard right into the garage area. According to NBC, a leaking caliper seal on the left-front of Bayne’s car required a complete replacement of the braking system. 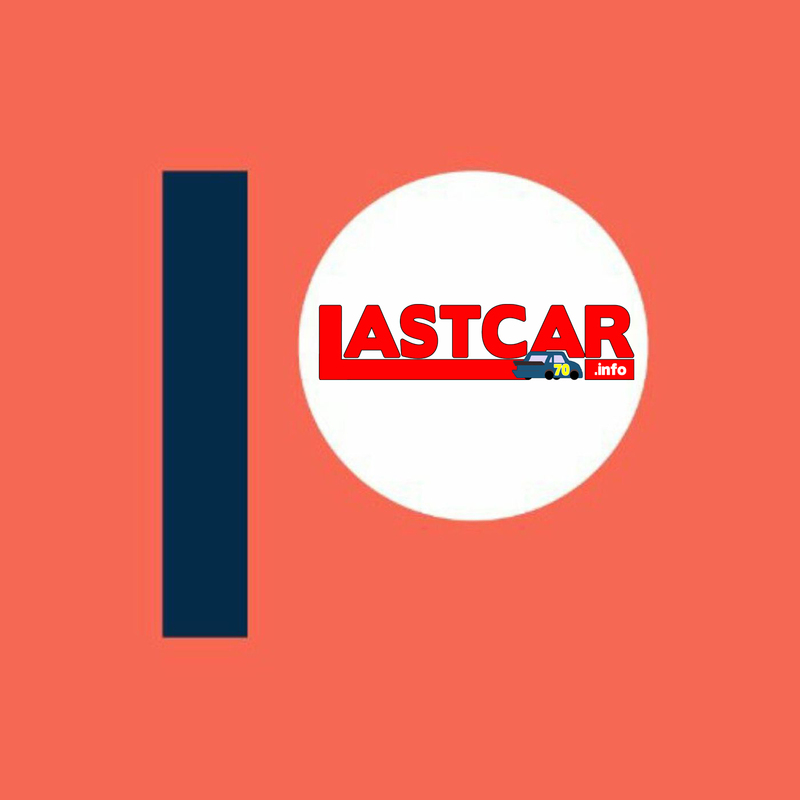 It wasn’t until Lap 10 that Bayne was on the move again, driving out of the garage and back onto the track, and not until the 11th circuit that he completed his first of 80. While Bayne was in the garage, Boris Said was struggling. Making his 54th and final Cup start, the veteran road racer announced in June that he would run The Glen for Circle Sport with The Motorsports Group with returning sponsor Genessee Beer on his #33 Chevrolet. Unfortunately, Said wrecked Saturday when he missed the chicane on the backstretch, then chose to drive through the grass, tearing the splitter from the front valence. The damage proved too much to repair, and Said had to make do with a car that wasn’t set up to run the road course. He stopped at the exit of pit road on the first pace lap, then by Lap 12 had run off-course in the chicane once more, this time missing corner exit. On that 12th lap, he was 62.163 seconds behind the leader, 8.447 sec behind Gary Klutt, and on the 15th circuit was lapped by Kyle Busch down the frontstretch. 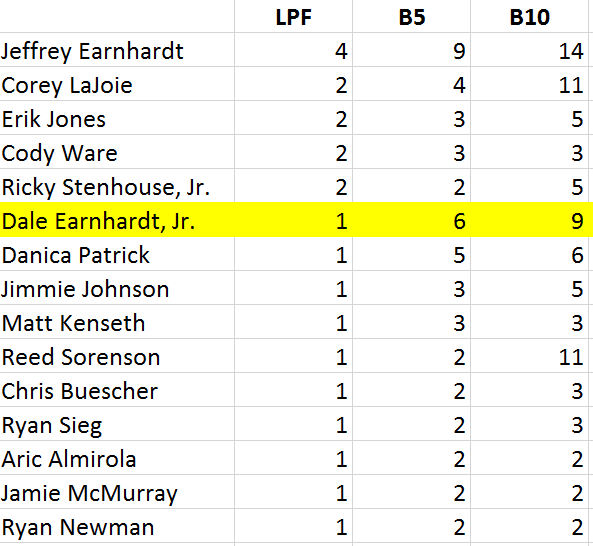 Earnhardt entered the last-place picture at about the same time. During the early laps, there was a problem with the digital dash on #88, and the engine sounded off to the NBC reporters around the track. 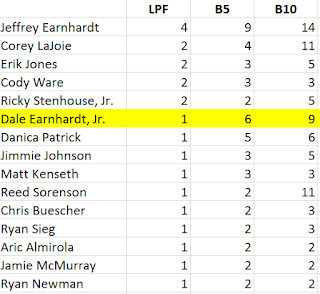 Much like Kyle Larson in the XFINITY race a day earlier, Earnhardt slowly started to lose positions, then pulled into the garage on Lap 23, during the caution that ended the first stage. There, the crew noticed a valve train issue that couldn’t be fixed in the garage. 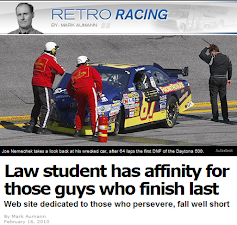 His car was listed as out of the race before Bayne’s lapped machine passed him on the 33rd circuit, leaving him last. In a race with just three cautions, Earnhardt’s car was the only one which failed to finish. 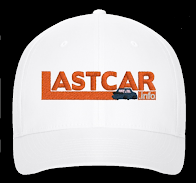 Bayne managed to finish 35th, passing the #34 Jacob Companies Ford of Landon Cassill. It was Cassill who drew the day’s only caution for an on-track incident, which came on Lap 53 when he cut down a left-front tire in Turn 1 and had to drive it around the track. At least two extended stays in the garage area left Cassill 12 laps down at the finish, his car well down on speed in the final laps. On the other side of Bayne was 34th-place Cole Whitt, who broke a track bar mount on his #72 RTIC Coolers Chevrolet during the final stage. Rounding out the Bottom Five was Corey LaJoie, whose #23 Dr. Pepper Toyota ran out of fuel coming to the white, then was split off Turn 5 by race leaders Martin Truex, Jr. and Matt Kenseth. *This marked the first last-place finish for both Earnhardt, Jr. and the #88 in a Cup Series race at Watkins Glen.